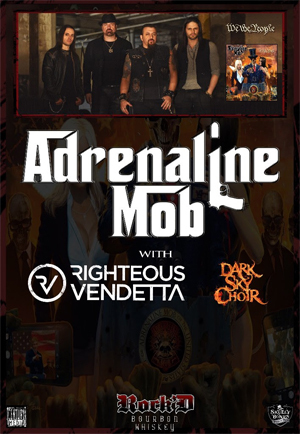 Hard rock/metal outfit ADRENALINE MOB have announced dates for the second leg of their We The People North American tour. Sponsored by ROCK'D BOURBON WHISKEY, the tour will commence in Dayton, OH on August 18 and reach its final stop on September 23 in Providence, RI. Direct support will be provided by labelmates RIGHTEOUS VENDETTA along with additional support from DARK SKY CHOIR. Tickets will go on sale Friday, July 14. ADRENALINE MOB's crushing brand-new hit album, We The People features 13 energetic, fist-raising and foot-stomping tracks that put the 'hard' back in 'hard rock' and the 'heavy' back in 'heavy metal'. Pick up a copy of the album, which METAL WANI claim will "make your head explode with its perfectly coordinated sheer musical brilliance", on Special Edition CD, 2LP + CD (including three bonus cover tracks) or digitally at http://smarturl.it/AMOB-WeThePeople.